According to the The Seeing Eye, Inc., their mission is to "...enhance the independence, dignity and self-confidence of blind people through the use of seeing eye dogs". Perhaps you've seen it in real life or on TV; a person walking a dog wearing a harness that has an extended handle. The dogs is slightly in the lead, seeming to be making all the decisions about when to stop and when to progress. The person may be wearing dark glasses, holding a thin white cane, or perhaps have neither of these items, yet it is apparent, that he/she is not out for the typical walk with a dog. Does Your Dog Need Dog Goggles? This is the usual scenario in which you find guide dogs, looking out for their masters and helping them live as normally as possible. These wonderful animals are highly trained and exceptionally devoted to their work, so let's take a look at how a dog makes the transition to seeing eye dog. Not all dogs are suited to guide the sight impaired, and so Seeing Eye, Inc. embarked upon its own breeding program in 1941. They sought to breed Labradors, and Golden Retrievers, as well as German Shepherds, because they consider them to be of the ideal size, intelligence, and temperament to carry out the work of helping the blind. Why carry out their own breeding instead of using dogs from breeders? Because, by establishing their own breeding programs, they could carefully track and weed out genetic problems such as dysplasia and PRA blindness. It is essential to use only completely healthy dogs for the program, since so much time and effort goes into their training. To put two years of preparation into a seeing eye dog, only to have to remove it from the program due a deteriorating illness would be a tragedy and would leave the dog's owner once again looking for a trained canine companion. Training for these animals is done in stages. From approximately seven weeks to eighteen months of age, potential seeing eye dogs are raised in the homes of volunteer 4-H families throughout the New England region. Each family provides its pup with complete socialization and affection necessary to become a happy, healthy dog. The 4-H families also provide their pups with basic obedience training, in preparation for more specialized training to come. These family-raised situations also help determine whether these pups show the proper temperament and intelligence to go on in the program. Respond to basic obedience commands. Lead in harness through the neighborhood and stop at curbs. Progress to leading in busier car and people traffic. Understand and carry out the concept of intelligent disobedience. 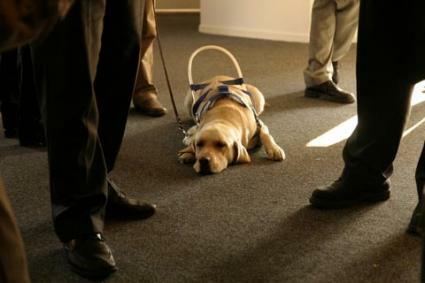 The concept of intelligent disobedience is an essential education for all seeing eye dogs. Should its master give a command to move left, right, or forward that would put the team in danger, the dog must be able to resist the command, and use its own judgment about when it is safe to move. When dogs pass their four months graduation, they are eligible for pairing with a human partner. The team then trains together, since the blind will also need to learn the correct commands that the dog will respond to and build trust with their canine partners. Once the pair finish training, seeing eye dogs are allowed to go where most other dogs are not allowed, including restaurants and hotels. Applicants must be schooled in independent travel before they can apply to the Seeing Eye to receive a guide dog. Each applicant will then pay an initial fee of $150.00 USA for the first session with their potential canine partner and approximately $50.00 for each session after that. This helps to defray the cost of the program, which operates mainly on donations from the public. It also gives the blind person a sense of dignity and accomplishment. However, it should be noted that no approved applicant would be turned away from the program for lack of funds. That is why public donations are so important. While the sight of a seeing eye dog team may prompt you to approach and ask questions or even pet one of these magnificent animals, please resist the urge. Your intentions would certainly be well meaning, but by taking the team's attention off what they are doing, you may actually be putting them in danger. It is best to admire from afar. As you can see, a lot of work goes into preparing a guide dog for its mission in life, and due to the dog's shorter lifespan, a blind person may go through two or more guide dogs during their lifetime. Much appreciation must be given to the 4-H families and the men and women who dedicate themselves to the care and training of these animals. Without them, the seeing eye dog program could never serve as many deserving people as it does. Guide Dogs of America: information about raising guide dogs for the blind.